I’m following about 50 people on twitter. some of them post regularly some of them from time to time. what annoyed me was when people twittered automatically via some service about something they do VERY often (e.g. geocaching: “i found the cache XYZ”). i posted automated messages on twitter. no actually in my case i let twitterfeed check for my flickr photo stream RSS feed for new images, that the service could then publish as twitter messages. although i explicitly set twitterfeed to only check for photos that had ‘tweet’ as tag to avoid spamming the daily image annoyed some. twitter is a platform where spontaneous messages, thoughts, findings, fun facts and any type of content can be published, without the overhead of formulating a big chunk of text e.g. a blog. twitter is great to publish tiny little bits of content that are greatly incoherent. people love twitter because others remind them of stuff they did not think of and pull them a little aside from the usual dirt tracks they use in their every day online life. do not post the same stuff over and over again. there are already platforms out there that offer a way to publish content in different ways such as video or photo sites: youtube, flickr, picasa, vimeo, etc. these platforms offer a great variety of services that users can access mostly for free. this includes distributing their content and making it accessible to others via different ways and formats: standard HTML (normal web surfing), RSS and atom feeds and maybe an API. use it! one should not abuse a service for something it’s not! this is definitely the case when you use twitter to divert a RSS feed as i did. let the original service serve its RSS feed. this way people have the choice to follow your contributions on another platform if they wish. post a message on twitter that you offer a RSS feed about a specific topic and people can get it from there. to sum it up: follow my daily image here if you like. subscribe to my blog via RSS or Atom feed. i even have a youtube feed. let me know what you think, post in the comments or send a trackback. if you don’t know what RSS is read on on wikipedia about RSS and Atom feeds. 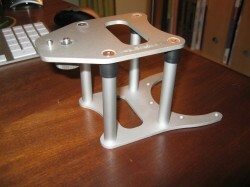 a few weeks ago i got my hands on a motorcylce camera stand (thx Patrick). one that was actually made for a motorbike and not a modified tankbag with rubber wraps. please don’t ever use those and please do never put a camera into your helmet as some youtube idiots present. the camera i used is my canon ixus 750. since the lense on this camera is rather low i had to improve the camera stand. i added some aluminum ducts to make it higher and to make the camera see the street. about 7 centimeters were enough. since i was not able to get the CHDK timelapse to work i shot video. to generate a timelapse i used ffmpeg to extract images out of the video and to unite them to a timelapse video. note that it is important for ffmpeg to have the images you use to generate the timelapse video in order and sequenced. if you decide to delete some images you have to rename them and must not leave gaps. also you may have to vary the rate (i used: 1.4) acording to the speed of your input video and the speed of the output video you want to have.